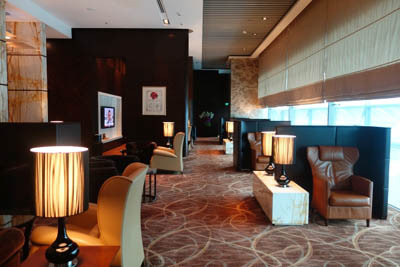 An AIRPORT LOUNGE is a facility owned by a particular airline (or jointly operated in the case of an alliance). Many offer private meeting rooms, phone, wireless and Internet access and other business services, along with provisions to enhance comfort such as free drinks and snacks. At lounges, passengers also find more comfortable seating, quieter environments and better access to customer service representatives than in the airport terminal. AIRPORT ANGEL - "Airports are often perceived as a frenetic element of a journey, frequently thought of as noisy, busy, hectic and stressful places. Our Airport Lounge service aims to diminish some of this stress by offering somewhere away from the hustle and bustle to wait and relax before boarding a plane." PRIORITY PASS - since 1992. 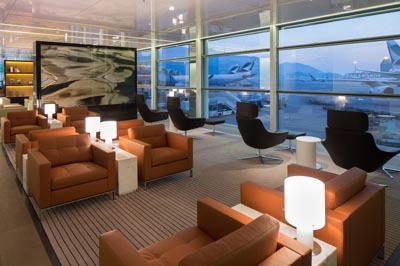 "Priority Pass is the world’s largest independent airport lounge access program. Membership offers great value for money and allows you to use any of 700 airport lounges (300 cities, 100 countries) whenever you travel." World's most luxurious airport lounges - "Super-luxe airport lounges that may make you miss your flight." Admirals Club Lounge - "Within the airport, a quiet, relaxing oasis awaits you." American Airlines, Miami International Airport, FL, U.S.A.
ALASKA AIRLINES BOARD ROOM - Sea-Tac Airport International Airport, Seattle, WA, U.S.A.
ASIANA LOUNGE - Incheon International Airport, Seoul, Incheon, South Korea. Clubhouse - Virgin Atlantic, Heathrow Airport, London, U.K.
Diamond First Class lounge - Etihad Airways, Abu Dhabi International Airport, Abu Dhabi, U.A.E. DILMUN LOUNGE - Bahrain International Airport. "The multi-awarded Dilmun Lounge which is also operated by BAS, offers an oasis of relaxation to premium-class passengers and has achieved numerous awards among them being the highly prestigious “Lounge of the Year - Middle East & Africa” award for the past six consecutive years." 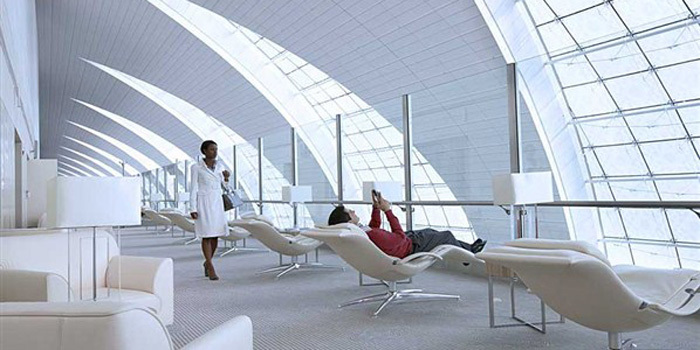 Dubai Airport Lounges - Emirates, Dubai International Airport, Dubai, U.A.E. FINNAIR LOUNGE - Terminal 2, Helsinki, Finland. Priority Pass Lounge of the Year 2011. Galleries Lounge - British Airways, Heathrow Airport, London, U.K.
JFK Clubhouse - Virgin Atlantic, John F. Kennedy International Airport, Terminal 4, New York, U.S.A.
l´Espace PremiÈre Lounge - Air France, Charles de Gaulle Airport, Paris, France. Millennium Lounge - Istanbul Ataturk International, Turkey, Turkey. Premium Lounge - Lufthansa, John F. Kennedy International Airport, NY, U.S.A.
Red Carpet Club Lounge - United Airlines, San Francisco International, CA, U.S.A.
SilverKris Lounge - Singapore Changi International Airport, Singapore. 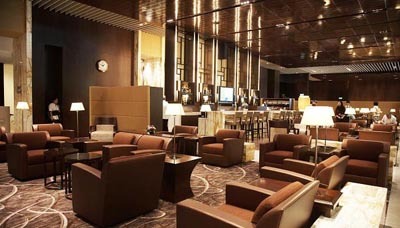 "Whether you just want to relax over a drink or attend to urgent business before you begin your journey, you can enjoy world-class comfort and service in our SilverKris Lounges at Singapore Changi International Airport." SUMAQ VIP LOUNGE & BUSINESS CENTER LOUNGE - Jorge Chávez International Airport, Callao, Lima Peru. Priority Pass Lounge of the Year 2010. 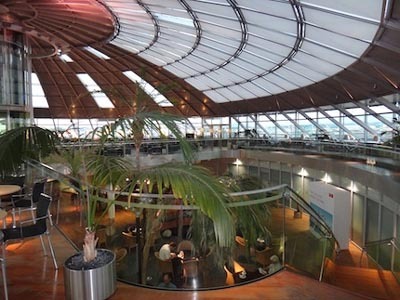 Swiss Lounge - at Basel-Mulhouse EuroAirport, Saint-Louis, France. 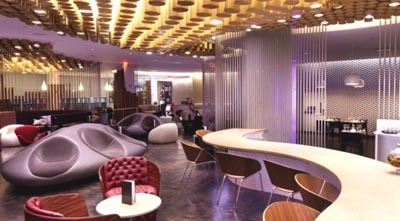 Terraces Lounge - British Airways, John F. Kennedy International Airport, NY, U.S.A. The Private Room - Singapore Airlines, Terminal 3, Singapore Changi Airport. Meant for Singapore Airlines Suites and First Class passengers. The Wing Lounge - "The World’s Most Exclusive Balcony." Cathay Pacific, Hong Kong International Airport, Hong Kong.